For years, Peggy and Matt Stevens traveled all over Mexico, exploring different cities and states, and checking out properties for sale to get an idea of what was available. Eventually, after many visits, they decided that Mazatlán was where they wanted to be. Matt, a musician, was excited by the vibrant, year-round calendar of cultural events; Peggy loved being able to walk everywhere. Both loved the friendly expat community, affordable cost of living, and being right on the coast. Neither of them had retired at that point, but their work as nurses allowed them extended vacation time each year which they used for exploring. When friends suggested they might buy something in Mazatlán together, they jumped at the chance. Sharing a property seemed like the perfect way to “test” how life would actually be if they lived in Mexico. They met with a local real estate agent who asked pointed questions about the expectations and lifestyles of both couples. They decided on a price range that worked for both parties to pay cash, with Peggy and Matt using an equity line of credit while they waited for one of their U.S. properties to sell. Although both couples were charmed by the renovated colonial homes in Centro Historico, they were all experienced enough homeowners to know that these would require more maintenance than they were able to give at that point. The real estate agent suggested an apartment might be the best option: It could be secured completely during the months they’d be away, and would be easy to generate income as a rental should they decide to go down that route. The couples eventually agreed on buying a two-bedroom, 1,000-square-foot condo with an ocean-view balcony, half a block from the beach and malecón (boardwalk) in Olas Altas, and a five-minute walk from the Plaza Machado, restaurants, and the theater. It came completely furnished, with linens, a fully-stocked kitchen, and all appliances. It also had a rooftop they could turn into a patio space. The price was only $115,000, well within the couples’ budget, and property taxes were just $55 a year. For about 18 months, the couples each spent time in their shared condo, amicably working out which dates were best for each. Peggy had just retired from work when their co-owners contacted them with a lucky coincidence: They wanted to sell their share of the property. The timing couldn’t have been more perfect. Using savings they’d put away for retirement, Peggy and Matt happily bought them out and proceeded to make the condo their home. They turned their share of the roof into a spacious patio, building an outdoor kitchen with a sink and barbecue, renovating an existing bathroom, and putting up a retractable awning for shade. Living room furniture was reupholstered and they made one bedroom into a guest room with two single beds for grandchildren to come visit. Lastly, they painted all the rooms in colors they loved, and had a local artist paint a mural in the dining room of the nearby coastline. Peggy and Matt—both retired now—consider themselves lucky they were able to buy their condo when and how they did. 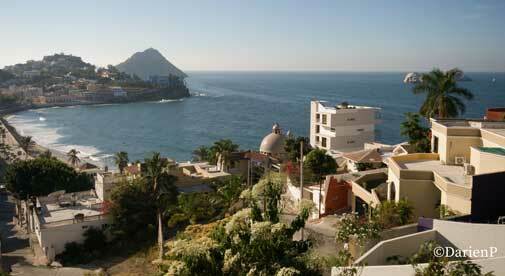 Property values have risen and Mazatlán is enjoying a renaissance as the government pours money into a myriad of beautification projects, many of them in Centro Historico, where their apartment is. Because they did their homework and were open to an unusual opportunity, they’re now reaping the rewards, while enjoying the beautiful sunsets, fantastic food, and relaxed lifestyle they’d dreamed of for so long.